The note has some text. The note icon is sufficiently large more than the title and (option subtitle). For containers, including agents, the title height ($TitleHeight) area is sufficiently large. The note is not an adornment or picture adornment. Adornments don't have text. More strictly, they do have $Text but even if it has a value it cannot be displayed like note text. The note does not use a shape for display. The note has no $TableHeading or $TableExpression set. See below re table expressions. $MapBodyTextSize is not set to '1', so as to suppress table/text display. 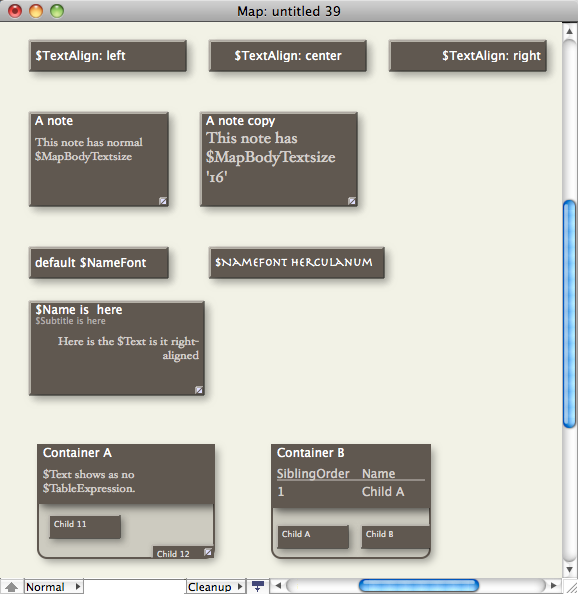 Notes with no title will display body text if present; previously body text display was suppressed in such notes. Do note that the text that is displayed is not styled; think of it as a $Text 'preview'. Also, any embedded images within the text are not displayed. An attribute $MapBodyTextSize lets a specific font size for the body text be chosen, including suppressing any display of text. $MapBodyTextColor sets the colour used to display such text. Setting $MapBodyTextSize to a value of 1 will suppress text display even if there is body text. The font that used to render the title is set via the Maps document setting Map Font but can be overridden at note level by setting $NameFont to a different value. The font that used to render the text is set via the Text document setting Text Font but can be overridden at note level by setting the $TextFont to a different value. Displayed text is aligned according to $TextAlign (default: "left") whilst title and subtitle alignment uses $NameAlignment (default: "left"). Once a map note displays body copy its title is no longer vertically centred; there is no setting to override the latter. A table expression is drawn in the same part of the map icon used to display a note's $Text, therefore both cannot be shown in the same map icon. If $TableExpression or $TableHeading are set, $Text will not be displayed. More on container table displays.